A note added after the original post: "Sue G. signed the guest book and said, "Okay, first the disclaimer: I did NOT say you would get a lot of flack for putting ketchup on your hot dog. 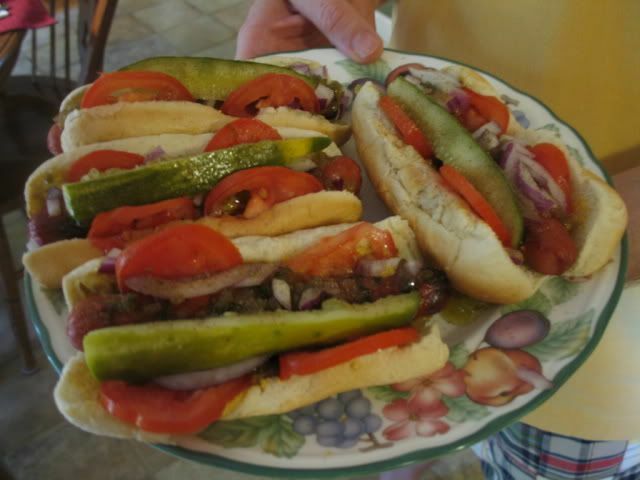 I DID say that putting ketchup on your dog and calling it a Chicago dog is a misnomer." 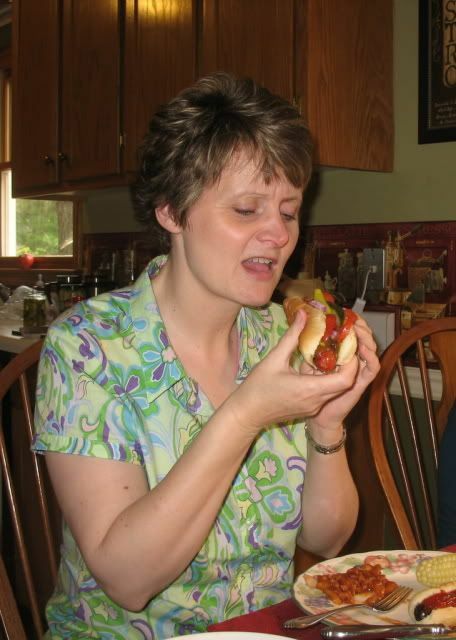 So I stand (and sit corrected) and want to hereby proclaim to all that Sue DOES think it's pretty normal to put ketchup on a hot dog; however, SHE doesn't personally like them that way. Since Nate was gone on Father's Day we had a belated Father's Day meal earlier this week. 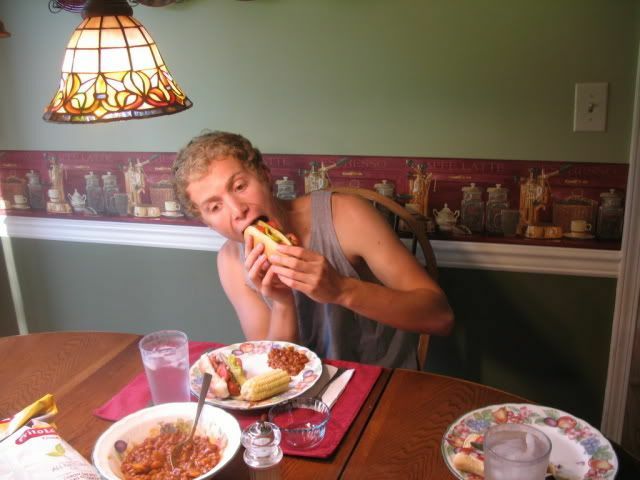 For some strange reason Steve got it in his head that he wanted his special meal to consist of Chicago Style hot dogs. I didn't even know what a Chicago Style hot dog meant so I immediately betook myself to the Internet and discovered this important factoid. "A Chicago Style hot dog contains a list of ingredients--longer than the hot dog itself--that Becky Smith would absolutely hate eating." And so on Wednesday night, the Smith Family set up a Hot Dog Shop, Chicago style. Nathan grilled the dogs and then Steve very happily "compiled them." From what I could discern, there was relish, mustard, celery salt, onion, peppers, tomatoes, and pickles. Is that nasty, or what? Oops. He had forgotten the peppers. NOW they're complete. Please note: If you're planning on eating one of these (yucky) concoctions, you must have the ability to open your mouth extremely wide. Thankfully, Nathan came equipped at birth with a pretty wide mouth. His take on the dogs? He said he was glad he had them but he probably wouldn't eat them again. Isn't he just the soul of diplomacy? Okay. Now this is where it gets really good. After Steve had convinced Nathan to try ye olde hot dogs, he laid on all his considerable charm and asked if I would (pretty please) try just one bite. In the interest of marital bliss and in the pursuit of a brave and courageous mindset in regard to the culinary arena, I capitulated. Now let me apologize in advance for the fact that these pictures are a little vague as to revealing whether or not I enjoyed that bite; you will have to study them very carefully. Are you ready? Is your magnifying glass ready? Are your powers of observation polished up? And you can stop wondering if I was really wearing make up, because I wasn't. (It had all dismally dissipated by then.) I realize that the pictures are even more scary than they would have been otherwise--a woman making faces with a make up-less face is not for the faint of heart. I do apologize for what I just put you through. After the drama-drenched hot dog dinner, the four of us launched into dish doing. 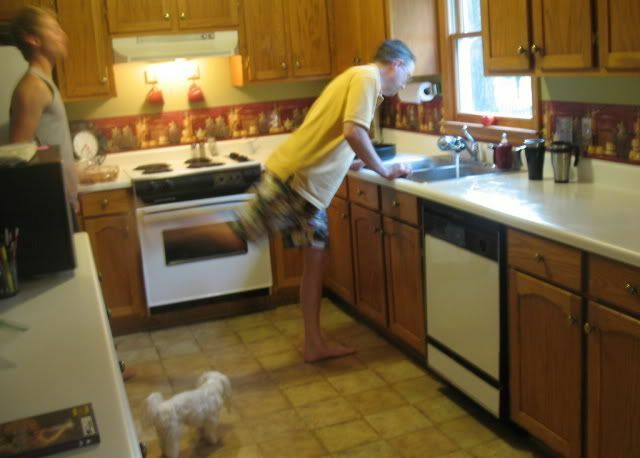 While Steve got busy over at the sink, Nathan decided that in between his cleaning duties, he would dance a little. Finally, Steve decided that the Young Pup needed a lesson from Big Daddy Dog and he suddenly delivered a backward kick packed with incredible speed and ferocity, all the while never even missing a beat on his Big Daddy Dog dish duty. Nathan was so intimated and astounded by this unexpected act of paternal Kung Fu-ness that he immediately fell back into line and started doing his work again. Of course, Snowy was there to help. Isn't that just such a beautiful sight? 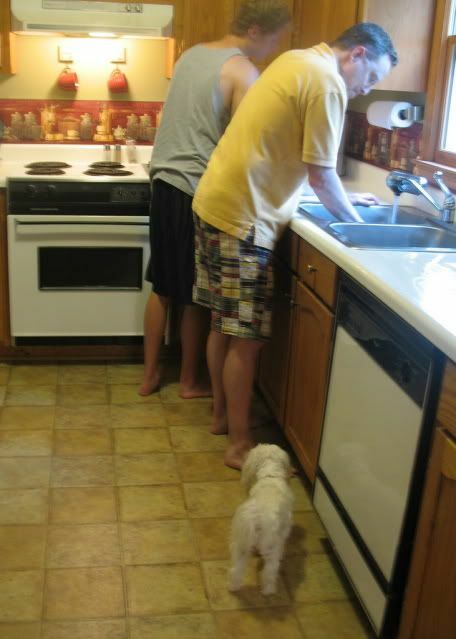 The Smith Men doing the dishes while the elder Smith Woman goofs off and takes pictures, and the Younger Smith Woman lurks behind the Elder Smith Woman and giggles at the two Smith Men. Eventually, the dishes got done, and the hot dog-eating, dancing, towel snapping, backward kicking, picture-taking evening was complete. A special day honoring a very special (Chicago hot dog-eating) dad. And NOW I need to ask all the folks who live (or have lived) in Chicago to let us know what YOUR version of a Chicago style hot dog is. And whether or you actually enjoy eating them? And I also would like to know--how many of you ALSO put ketchup on your hot dogs? I grew up putting ketchup on my hotdog. All. The. Time. Every Saturday night we had 'beans and franks' for dinner. My father was the 'manners king' and was all about elbows on the table and if one hand was lying on the table, not being used to feed ourselves, he would give it a quick slap so that we would return it to our lap. Nice, huh? Fortunately, my parents split when I was 12 and things moved into the normal relm. We were able to get a dog, get baptized, and talk on the phone!! In all fairness, dad was OK, just not cut out for the family/marriage thing. He was a cardiac/thoracic surgeon who worked all the time. A genius with poor personal skills. He's 85 now and somehow in his older age has mellowed into a nice guy. Who knew? I actually enjoy spending some time with him-lol. Anyway, I digress. How did I end up there? Oh, back to the hotdog. In the last 5 years I have moved over to the 'mustard on hotdog' group! I don't know how that happened as I am VERY particular with what I eat. VERY. I rarely try anything new. So there it is. Ketchup be gone, after 45 years. Mustard it has become. I'm a native Chicago gal, though I've lived most of my life in San Diego, minus a return to Chicago for university, and I hate hot dogs under normal circumstances, but LOVE a good Chicago hot dog. To me, a Chicago hot dog is on a steamed poppyseed bun - and I, like you, only put ketchup on it. That's how I've ordered them all my life. Although I live in San Diego now, I've got a great Chicago hot dog place just a stone's throw (literally) from my place, and I will drop on in when I need my fix. And, even more exciting to me, Portillo's, a place I've only been able to get when I visit Chicago, has now moved out west, so I can go there for a yummy hot dog, too. Now if only Steak and Shake and White Castle would move west. I'm clearly a gourmet foodie ;-) Ha ha! Lisa in San Diego but who's currently in Czech. Okay, first the disclaimer: I did NOT say you would get a lot of flack for putting ketchup on your hot dog. I DID say that putting ketchup on your dog and calling it a Chicago dog is a misnomer. The Chicago dogs in your photo are more authentic, although as I have mentioned to Steve on FB, it does require a steamed poppy seed bun. I generally eat my hot dogs with mustard, onions and relish only. However, when at Super Dawg, Portillo's, or Luke's, I get everything as shown on the photo minus the tomatoes. Not too crazy about them on a dog. Now, I have never seen hot dogs eaten on china before. Nice touch, Bec. 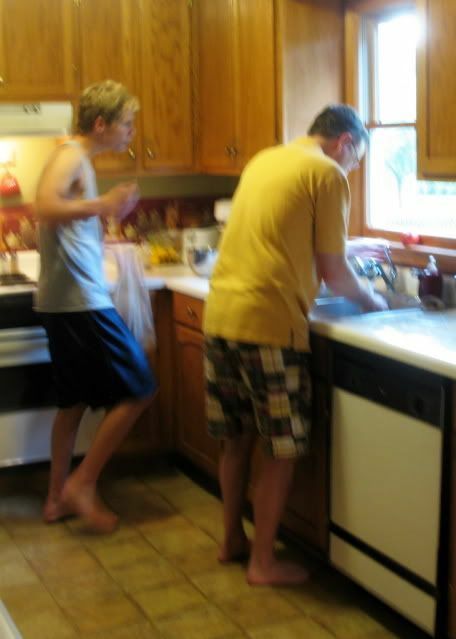 And I thought it sweet that Steve elected to do the dishes for his Father's Day extravaganza. Nice touch. 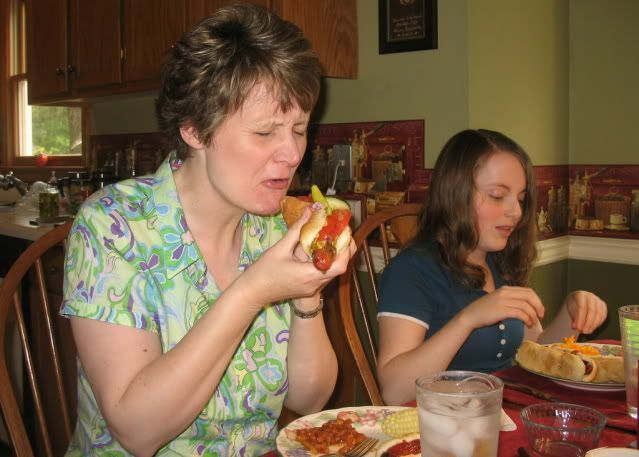 But in my entire life, I have never tasted a hot dog with ketchup. And I love ketchup. Just can't imagine the two together. I go back to Chicago in early August for my chemo check up and Portillo's here I come!!!!! The only thing I ever put on a hot dog is ketchup. NOTHING else, ever. Same way with hamburgers, though I do like a little pickle and cheese on those as well. But hot dogs have always been ketchup only. I do put ketchup on my hot dogs! In fact, it's the only way I will eat ketchup. I'm with you about the concoction Steve created. It's hard for me to believe you even tried it. Thanks for the pictures as proof. Being from South Florida, I grew up with hot dogs steamed in beer, topped with KETCHUP, mustard, chips and chili. I cant' remember when I tasted my first Chicago dog; but do remember cucumber instead of the dill pickle spear; either is acceptible so I've found. However, as Bec did research, even after the meal, it seems certain now that yellow mustard is authentic and that my use of spicy brown mustard (Gulden's)and cutting the tomato in slices instead of wedges were definitely heinous culinary faux pas. To you purists out there (you know who you are, SG!) my sincere apologies. 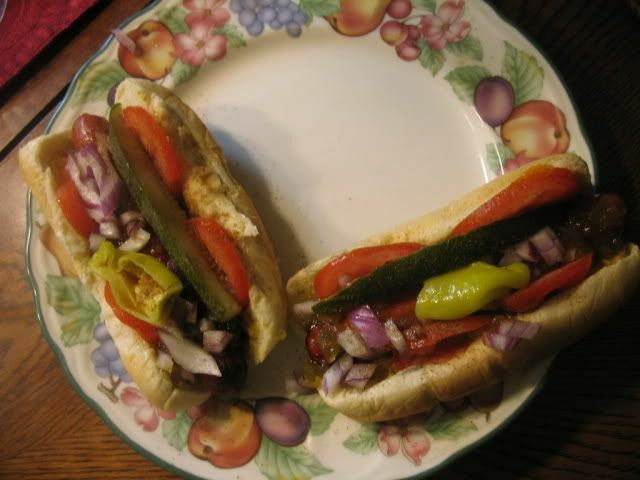 As to the ketchup issue on dogs, I find the combo boring and prefer to add onions and mustard. I also like dogs with onion, mustard and relish. For those uninitiated to Southern quisine you really should try a dog done "all the way," NC style! The components in order are regular bun, dog (bright red in our county), onions, mustard, chili and cole slaw. Good stuff! I also enjoy dogs NYC style with saur kraut, onions and mustard. Saurkraut is sort of like Bagpipe music, either you love it or hate it. As for me I like both! Ketchup is about all I usually want on my hotdog. Unless chili is available, then it is chili and mustard. Ah yes, I have to agree with Steve on the NY style hot dogs.....give me a dog with onions, relish, sauerkraut, mustard AND ketchup & I'm in heaven! Plan on firing up the grill later today & doing that very thing! Happy 4th guys! All I know from reading all these comments is one thing: Now I'm hungry!!!! And, yes, Steve, the tomatoes are supposed to be thinly sliced and cucumbers can be added (I use neither). 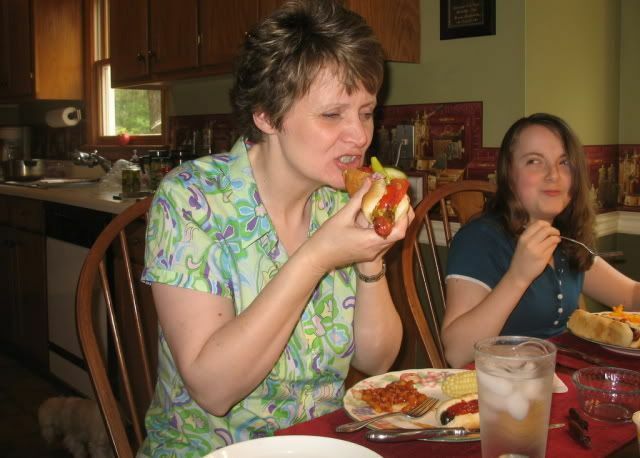 To Jill, whose kids went to Chicago and ate real Chicago dogs with ketchup only: The only thing that made those dogs Chicago dogs was that they were bought and eaten in Chicago. Ketchup only is not a Chicago style dog. Having said that, I hope they had a great time in Chicago, food or no food. Great city! Steve, I have never had a hot dog with cole slaw, but I can imagine one and it doesn't sound bad at all. YOu sound like a person with very eclectic tastes in food. You must be a joy to cook for! Becky, you don't even need a chat room because we tend to chat it up all the time on your blog comment site!!! Just shows you how much you make us feel at home here. Thanks! First time in ages, I can not get the page to load sense the upgrades. Wishing the pictures would load. I bet we are the ONLY family here that does not even have KETCHUP in the fridge! My husband puts sourkrout (sp) on his hotdogs, and me d'join mustard. As for my daughter. I think her main staple of food is pickles! Pam D's post about THE VARSITY brought back so many memories! 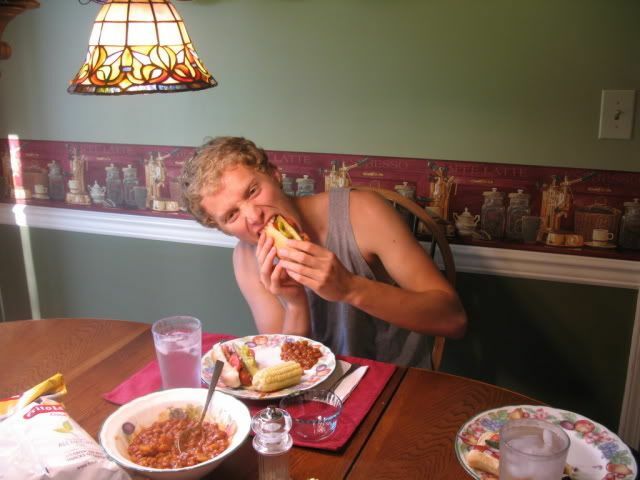 I live in PA now and boy do I miss their hot dogs (chili and mustard) and greasy onion rings! Did you know that The Varsity is the world's biggest drive-in restaurant? I am from Chicago. Ketchup.....yuck and never on a hot dog. I hate ketchup on anything. Bright green relish, raw onion, cucumber or pickle, yellow mustard, celery salt, tomato. Hot dog is Vienna beef and steamed so it has "snap" to it. On a poppy seed bun. Somehow missed this one. Guess it is because of all going on this past summer. I like hot dogs with just mustard, chili, and slaw--no hot dog (weiner) in the roll. Some call that a chili dog but at some places they don't sell chili dogs so I just ask for a hot dog without the weiner and can get what I request.